One of the most popular reasons millions of tourists visit Thailand is the amazing food on offer. Thailand boasts some of the best chefs in the world, with a whole array of flavours, spices, herbs and tastes. Thai cuisines suits everybody with so many dishes to choose from, you'll soon become a Thai food expert. If you eat in some of Thailand's restaurants or street vendors you're bound to be introduced to something new. Despite the efforts of Bangkok street markets to be reduced, there seems to be more and more appearing. Rather than name every single dish we think you may like, we thought we'd narrow it down to the first ones you should try. Thailand's most popular and national dishes are below, so take a read and make sure you try them! **Just a reminder, we have a mini boutique cafe outside of Nappark, where you can order our very own Thai Green Curry. We promise you, it's amazing! Probably the most well known dish to visitors to Thailand, and arguably Thailand’s ‘national dish’, Pad Thai is always a winner. Either with chicken, prawns, pork, or vegetarian, Pad Thai is a noodle and egg dish that is easy to make. You can buy this for as little as 30 baht in and around the Khao San area! One of Thailand’s most authentic and traditional restaurant dishes, the Thai Green Curry. You can either eat this with chicken or pork, but we’ve chose chicken. This dish doesn’t have to be spicy at all, despite it being made with chilli and a creamy Thai herb flavour! Another adaption of the Thai curry, this times the Red selection. Although this is more popular with chicken, it’s a great and tasty choice for vegetarians too. This is a mild curry that will make your tastebuds explode. Can be done with Tofu too! Another Thai classic, and another curry to devour! The Massaman Curry can be done with chicken or beef, whichever you prefer. This time, the curry is a little chunkier, with potatoes also being served. The Massaman has a tasty sauce in the mix and again served best with rice. Note** This dish contains peanuts. 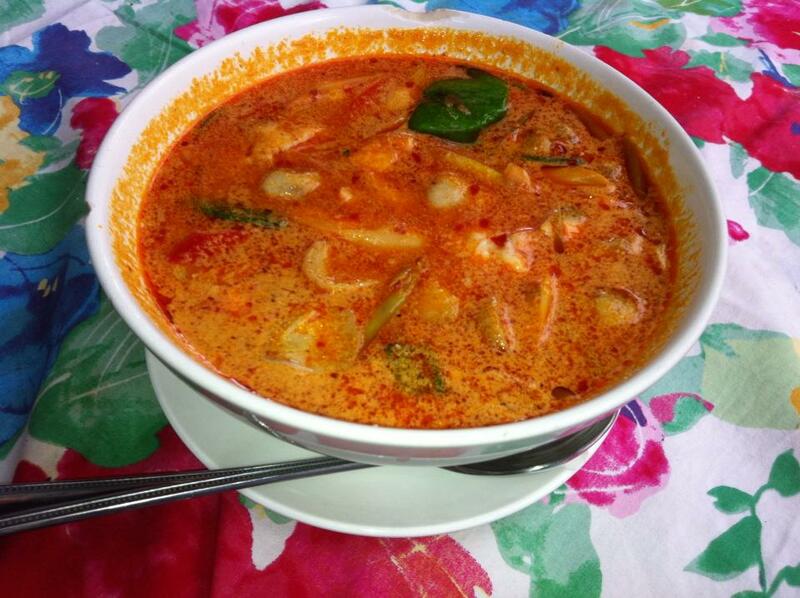 Perhaps the Thai version of Gumbo, Tom Yam Soup is a seafood induced Thai broth with a unique, tangy taste. Prawns are typically the main ingredient with a variety of vegetables. One of Thailands classic dishes for the ages! Can be either used as a main meal if you want something light, or as a side dish to compliment your main, the papaya salad is another popular Thai foodie creation. Sweet, sour and crunchy, Papaya salad is quick to make so you won't be waiting long before you eat this healthy dish! However, you won't normally find this as a street food option.